How long do I have to be tortured for? Will I be rehabilitated? Where are the programs available to rehabilitate me instead of torture me? I would like to shed some light regarding Institutional Gang Investigator (IGI) E. Duarte. I’ve been in ASU (Administrative Segregation Unit) since Oct. 26, 2009. 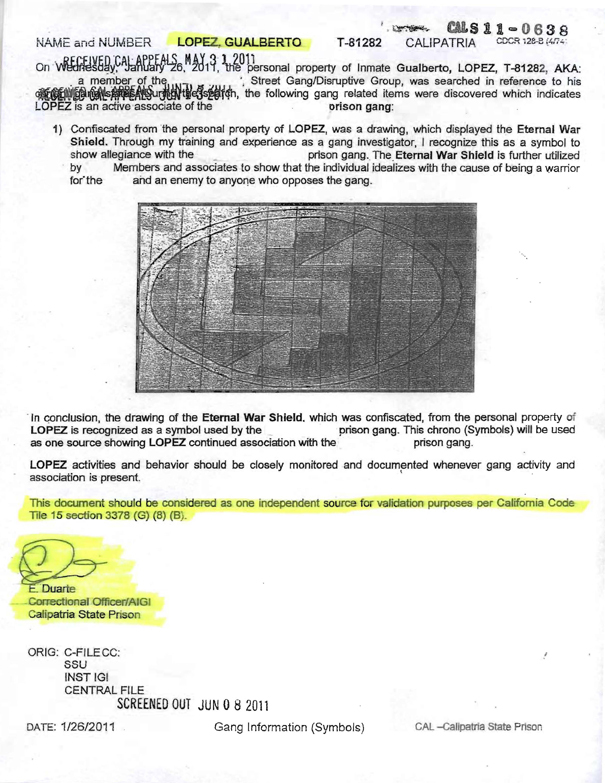 I am currently validated as an alleged associate of a prison gang and I did have a discussion with IGI E. Duarte prior to being placed in the hole (segregation). That bad day took place on May 14, 2009. IGI E. Duarte and his sergeant forced me to sign what’s called a “safety chrono.” When I refused to do so, I was threatened to be placed in the hole. How it took place was as follows: After taking my work shower on my return from my vocation assignment (job) and yard was recalled completely in B5, I was walking out of the shower and I noticed a sergeant just looking at me. He didn’t say anything though. I did not have five minutes in my cell when my cell door reopened and I was told by the tower that I had a 115 hearing in the program office. I told him to close my door, didn’t think he was serious. So he did, just to reopen it, and he said, “They want you to go to the program office for a 115.” I asked who is “they”? He replied, “The sergeant.” I replied that the sergeant was just here and did not say anything, plus the sergeants don’t hear 115s – it’s the lieutenants that do – plus I didn’t have any 115s. That bad day took place on May 14, 2009. IGI E. Duarte and his sergeant forced me to sign what’s called a “safety chrono.” When I refused to do so, I was threatened to be placed in the hole. Then it was given to IGI Tamayo, who read it. I then asked him, “This is what you’re using to remove me from general population?” I asked because they did so with another inmate in my building. IGI Tamayo said, “Oh, you’ll know when I come for you.” I got into a little discussion of how come they can’t just take my word that I have no safety concerns and I don’t know what’s really behind this chrono because it doesn’t say if and how it was proven to be true or reliable. So in reality I don’t know what and why I’m signing. Then IGI Sgt. E. Silva jumped in saying to chill out, that I do need to sign it or they will place me in the hole (ASU). I ended up signing because I had a lot going: I was in vocational training – AA classes – in cell studies plus earning good time credits, and I remained in B yard for five and a half months until the incident involving inmates and COs (correctional officers) in B-2. After the incident with Velarde (Velarde vs. Duarte, Case No. 3:2011cv00287 in the United States District Court, Southern District of California) and CO Magdaleno, who hit the inmate while he was cuffed after the searches, me and other Mexicans/Latinos/Hispanics were placed in Ad-Seg – the hole! 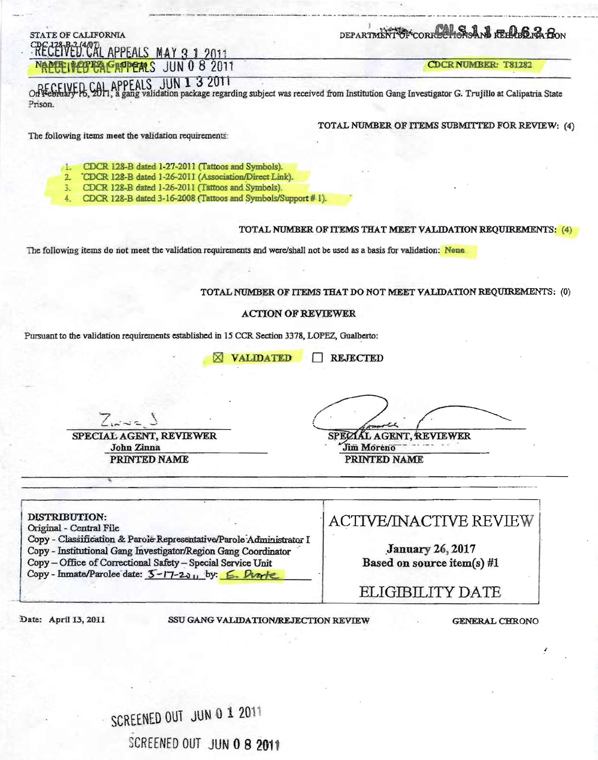 I got targeted in this validated process, and I assert and refute the following: I was picked up by IGI pending an investigation into alleged association(s) with a prison gang and as an alleged active member of a street gang/disruptive group. I refute IGI’s source items used against me in this duo-validation individual and collectively and assert that this malicious targeting was done in retribution and revenge for the prior incident involving myself and IGI Duarte in which Duarte exhibited a hostile nature and unnecessarily forced me to sign a “safety chrono” as well as a subsequent incident involving Mexicans/Latinos/Hispanics. I assert that Duarte’s unnecessary force was a personal attack on my character and positive programming in this institution. A fact supporting Duarte’s use of invalid information given by inmates seeking protective custody is illuminated by me remaining on B-yard general population several months with no incident, expounding on this doubly damning attack on my character. After the incident with Velarde (Velarde vs. Duarte, Case No. 3:2011cv00287 in the United States District Court, Southern District of California) and CO Magdaleno, who hit the inmate while he was cuffed after the searches, me and other Mexicans/Latinos/Hispanics were placed in Ad-Seg – the hole! They’re using my past against me in addition to IGI Tamayo’s alleged interview where he states I admitted to being a gang member. That is a complete fabrication of the events of such day and the abuse of power and malicious harassment by IGIs. 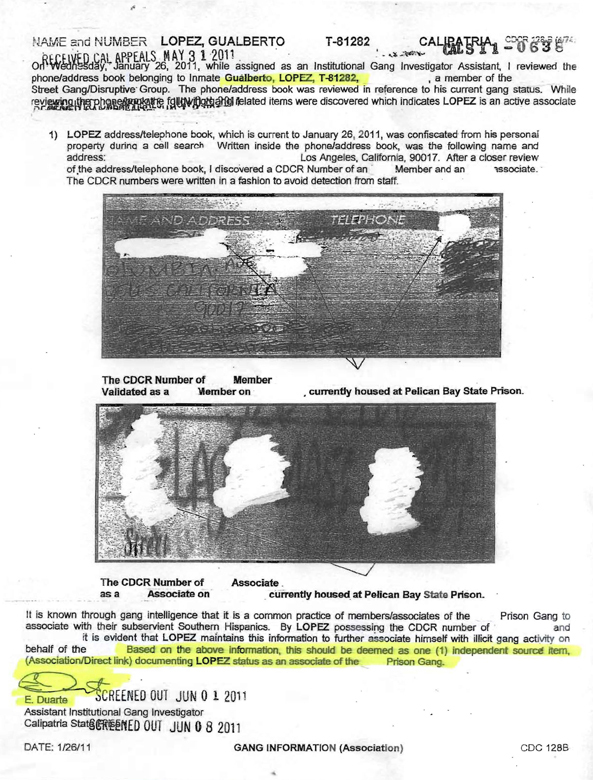 I have suffered these unconstitutional harassment specifically at the hands of IGI E. Duarte, IGI Tamayo, IGI Silva with a certain number of searches occurring after facility searches or returning from court in May 2008, with specific reference to incidents such as the constant search and seizure of property with no real provocation, no probable cause, and never yielding any contraband directly related to any association, either street gang or prison gang. Also, their malicious acts, such as withholding my outgoing mail and disallowing my incoming mail, are unconstitutional and put a strain on my family relationships. The malicious acts of IGI E. Duarte, IGI Tamayo and IGI Silva, such as withholding my outgoing mail and disallowing my incoming mail, are unconstitutional and put a strain on my family relationships. In 2009 I was given the street gang packet and was made to believe it was going to be submitted; so both packets gave me 11 points to rebut. I know how they go about their evil ways: 1) When Duarte and Tamayo came to pick them up, I slid them my arguments as soon as he got in front of my door and they stated, “You’re done?” looking all surprised. Plus when they left to do the copies they are obligated to give me, the copies were purposely made wrong! 2) All those points were obviously given to me all at once in hopes I get stressed out and not be capable of rebuttal nor do it correctly. 3) The IGIs were hiding my property because most of property consists of legal books and case law and coincidently I had a validation manual. I made it clear to all involved – officers and officials – how I was not going to allow their criminal tactics to be pushed on me without a fight on my behalf. They all told me IGI has to have it. Then like magic my property appeared but days before I was officially validated by Sacramento. I have several appeals/602s and staff complaints against IGI and ISU (Investigative Service Unit) as a whole as well as several of them as individuals. But I was expecting them to respond that their COs did nothing wrong. It doesn’t matter to me because I preserved my rights doing so. Before I bring this to a close, just recently I was served again with the street gang/disruptive group just because I requested the face sheet of that packet out of my central file (C-file) so they retaliated and reserved me. On my interview for it, I came out and IGI Duarte was there. I made it clear: What was he doing there if I have a staff complaint on him? And this past Monday when I went out for medical within the facility, I ran into IGI E. Duarte; he was the sergeant for that day. Yup, he’s a sergeant now. He was the last one of the squad that placed most all of us in ASU and he will be working in ASU a couple of days out of the week! I know for a fact there’s a lot of merit in appeals/602s and complaints filed against Duarte. How is it that he got promoted and, on top of that, (got assigned to) work where inmates he conspired against are housed and where he physically hurt an inmate. I know for a fact there’s a lot of merit in appeals/602s and complaints filed against Duarte. How is it that he got promoted and, on top of that, (got assigned to) work where inmates he conspired against are housed and where he physically hurt an inmate. People out there should request to be provided documents specific to what are the requirements for a CO to become a sergeant and what disqualifies a CO from getting promoted becoming a sergeant? Send our brother some love and light: German Cabrera, T-50054, ASU-197, P.O. Box 5008, Calipatria, CA 92233. These letters were written to and transcribed by Kendra Castaneda, a prisoner human rights activist, whose husband, Robbie Riva, T-49359, is currently in segregation at Calipatria State Prison ASU for validation as a prison gang associate, being labeled “worst of the worst” by CDCR. 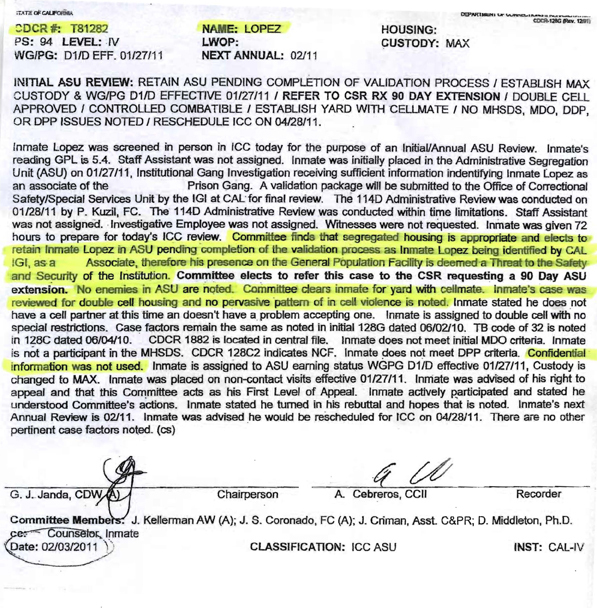 Her husband, like many other men at Calipatria State Prison, was validated by CDCR as a prison gang associate due to IGI E. Duarte authorizing falsified evidence.